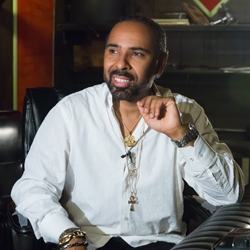 Lawrence "Boo" Mitchell is a GRAMMY Award-winning engineer, producer, composer, award-winning movie producer and studio owner. Boo is the son of legendary Hi Records and Al Green producer, Willie Mitchell. Boo began his storied musical career in 1987 at the young age of 16 honing his chops song writing and playing keyboards. His first paid session as a keyboard player was in 1988 on Al Green’s GRAMMY Award-winning “As Long as We’re Together." That same year, he formed a rap group called the M-Team. The M-Team was the first rap group from Memphis to release a full length album. The M-Team was also Memphis' first rap group to have a video played on MTV (Can You Kick It Like This). In 1993, Boo put his rap career on hold to work as manager and talent coordinator at his family's club, "Willie Mitchell's Rhythm and Blues Club" located on Memphis’ historic Beale Street. By the year 2000, the family closed the club and Boo moved on to be the manager of his father's legendary Royal Studios. In 2004, Boo’s talent and ear for award-winning music led him to become the chief engineer at Royal Studios. In 2011, Boo produced the documentary "Take Me to The River," the story of the music of Memphis and the Mississippi Delta. Released in 2015, the film has gained critical acclaim, winning numerous film festivals around the world including SXSW and London’s Raindance Festival. In 2016, Boo won the Record of the Year GRAMMY for the Mark Ronson/Bruno Mars hit "Uptown Funk." It was the first time a record made in Memphis has won a GRAMMY for Record of the Year.